Brown crabs, which like other crabs have both brown and white meat, are extremely commercially important and the crab fishery in British waters is one of the largest in the world. Brown crabs are found all over the British Isles, where the rocks and weeds provide cover. I’ve never eaten crab as good as the ones I tasted in Cromer, Norfolk, and in the Orkney Islands on this trip. These cakes showcase the delicious flavour of the fresh meat. Whisk the yolks, mustard and vinegar together in a medium bowl until smooth. Slowly pour in the vegetable oil, whisking well – this is easiest with an electric hand whisk. Continue to drizzle in the oil, whisking all the time, until the mixture has thickened. Season to taste. Put the crab into a bowl with the cooked potato, spring onions, chives, lemon juice and egg yolk. Season and mix well. Divide the mixture into 8 portions. Dust your hands with flour and form each into a round fish cake shape about 8-10cm in diameter and 2cm thick. Heat a nonstick frying pan over a medium heat. Drizzle with oil and pop the crab cakes in. Cook for 2-3 minutes on each side, until golden and heated through. You may need to cook them in batches. 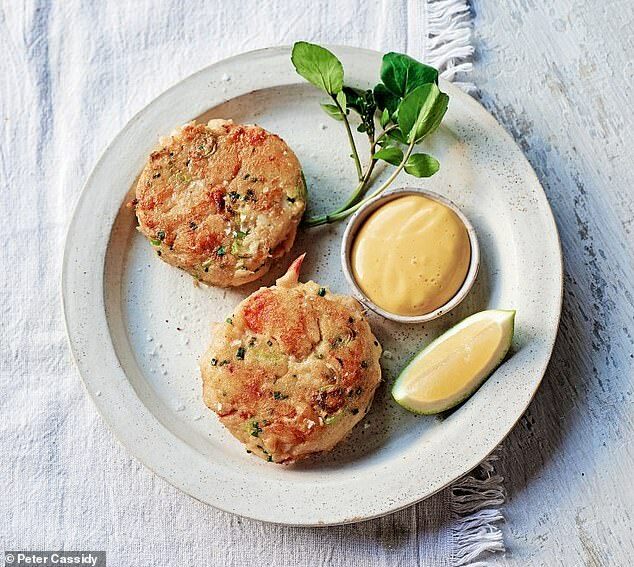 To serve, place 2 crab cakes onto each plate. Garnish with watercress and a lemon wedge, and serve with mayonnaise on the side.